It's like a scene from Indiana Jones and the Temple of Doom. 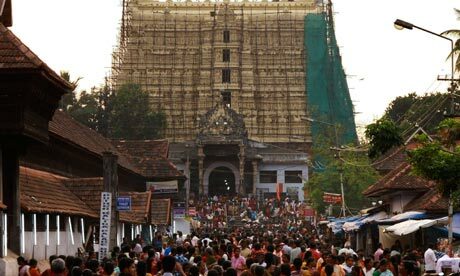 Even before the unlocking of the last of six secret vaults at Kerala's largest temple, the centuries-old treasure in gold, silver and precious stones discovered in its cellars is already estimated to be worth around £12.6bn. "Though we knew that offerings made to the temple by devotees for the last 500 years were lying in these secret cellars, the scale of the treasure has definitely surprised us," temple official Hari Kumar told the Guardian. "All of Kerala is celebrating this extraordinary find." Its discovery has made the Hindu temple of Padmanabha Swamy in the state capital Thiruvanthapuram the richest in India. During the past week, a team of experts appointed by India's supreme court has opened five vaults dedicated to the deity Lord Vishnu to uncover an enormous hoard of gold idols, jewellery studded with diamonds, emeralds and other precious stones, antique silver, and even two golden coconut shells studded with rubies and emeralds. The shrine dates back to the 10th century, but the present massive granite structure was built only in the 18th century after King Marthanda Varma expanded and consolidated the Travancore kingdom. It has historically been a royal temple, but offerings to the Lord Vishnu, in the form of gold and jewellery, have come not just from Travancore kings and other Kerala royalty but millions of ordinary devotees. The vaults containing the offerings have remained locked at least since the 1930s, when the last inventory was reportedly carried out by Travancore's then rulers. India's supreme court ordered a fresh inventory of the treasure after a face-off between the current head of the former Travancore royal family and a lawyer who challenged them about the management of the temple wealth, claiming there was inadequate security. "There are six vaults, from A to F, and only Vault B has still to be opened," says Kumar. "This vault has special locks, and we don't want to break them. So we're getting experts to examine them, and we should be able to open them on Friday." The entire operation is going on under heavy police security, but nothing is being filmed or photographed. "Taking photos within the sacred space of the temple is strictly prohibited," says Kumar. Kerala's chief minister Oommen Chandy has rejected the demand that the treasure should be used for public benefit. "It belongs to the Padmanabha Swamy temple and will be preserved there," he said.